wachoo doin’ with that hatchet? These just arrived, and I plan to give a full report later this summer when I have read them. I would like to sell more of the beautiful art I create everyday, and opening my studio for a show and tell/ sale appeals to me. So if you live near Dallas, watch for upcoming info on the studio tour. 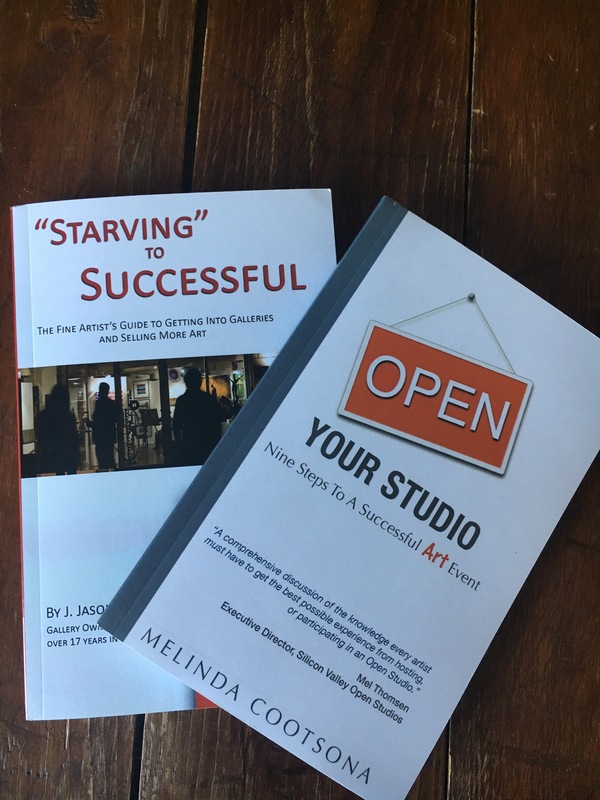 If you are an artist, I will review these books as I finish them so can glean the highlights or perhaps decide to read them yourself. 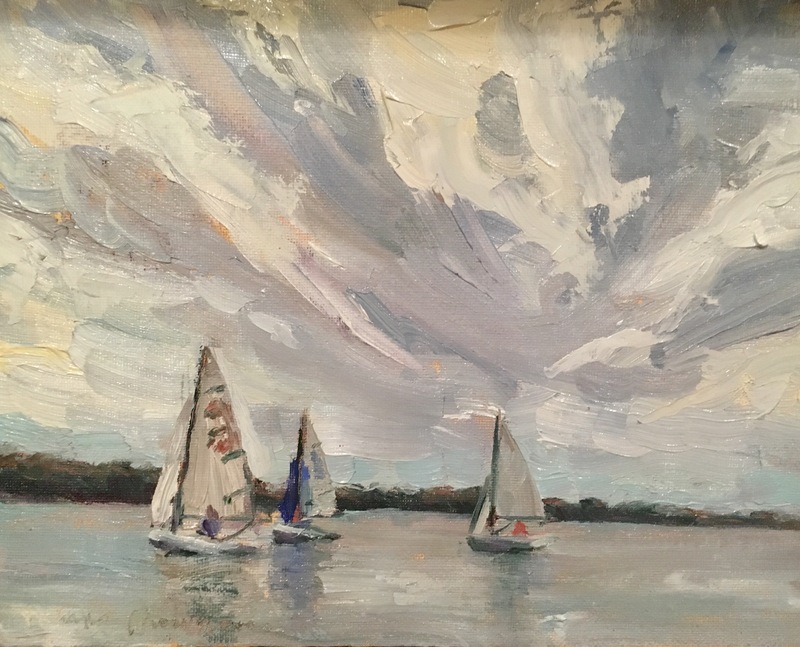 Sailing races at White Rock Lake. Beautiful afternoon! I started with an oil wash underpainting. 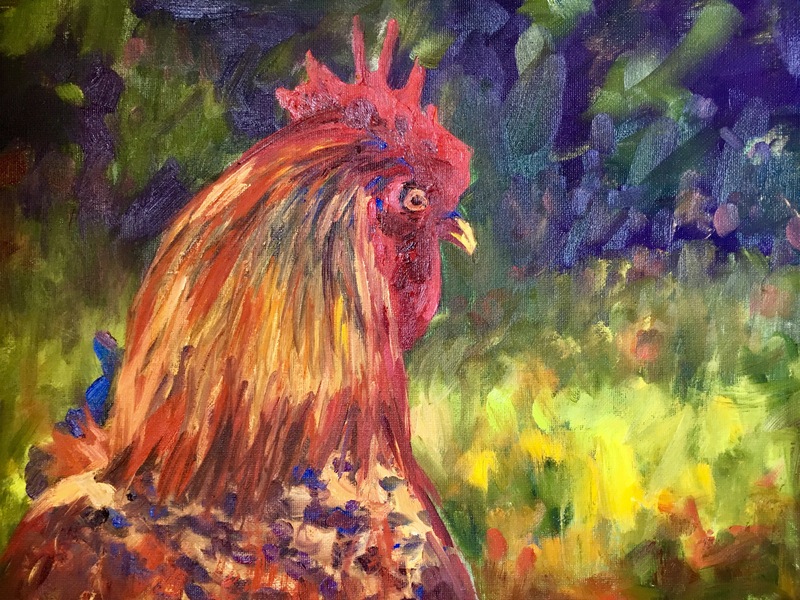 I used thinned alizeran crimson and ultramarine blue and LOTS of mineral spirits. I loved the subtle colors blocked in. 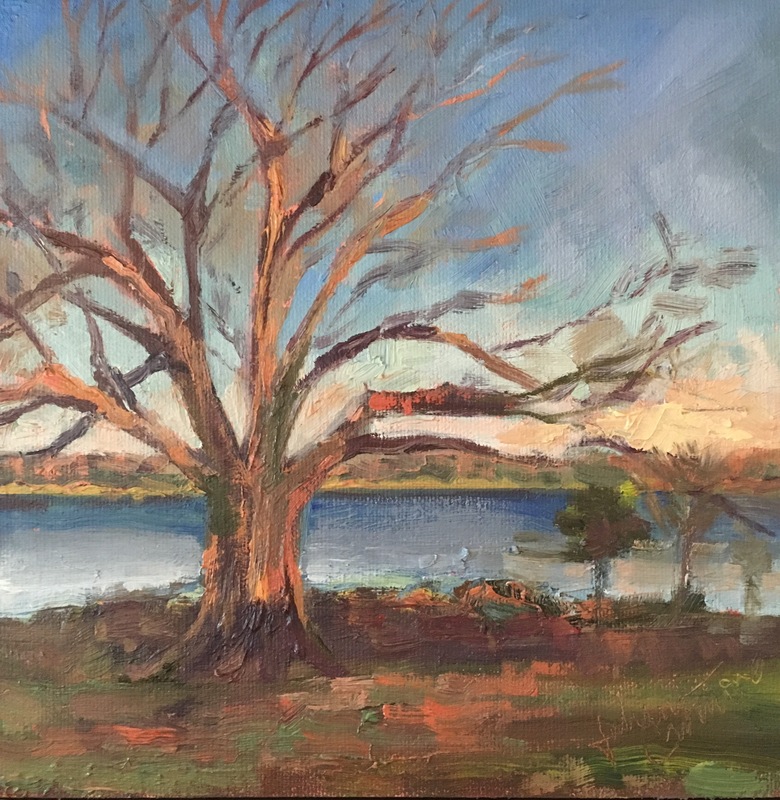 I finished the painting with touches in a hot coral pastel. The painting was beautiful, but didn’t quite look enough like summer, so I added some orange touches. That did the trick perfectly! 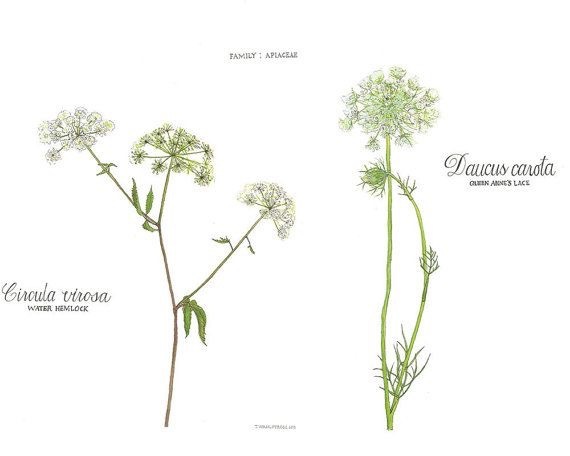 Did you know Queen Anne’s Lace has a edible root, like a carrot? In my reading, I also learned a very important tip. 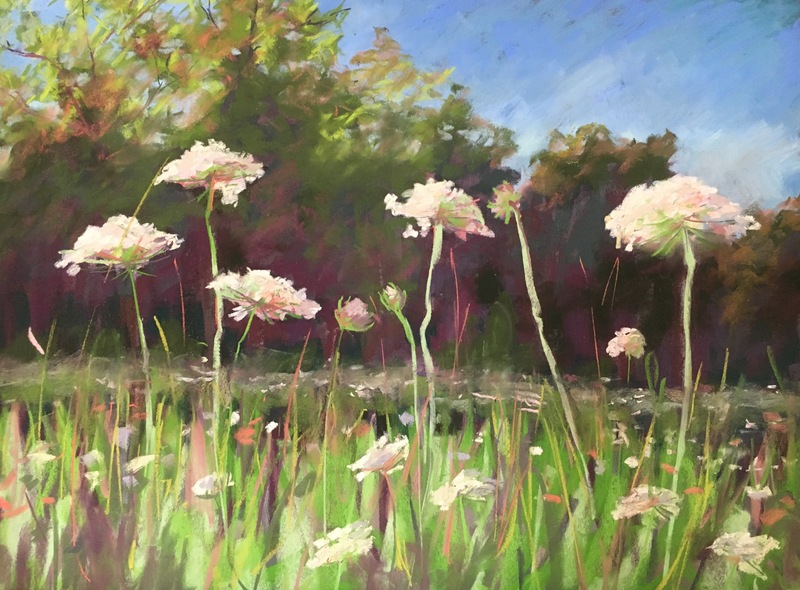 Queen Anne’s Lace has a deadly look-alike, Hemlock. Even touching Hemlock can poison you, and ingestion means almost certain death unless treated immediately. As the toxins from the plant absorb into your system, you slowly become paralyzed, your respiratory system fails, and you die. Below is an old illustration plate of the two plants side by side. 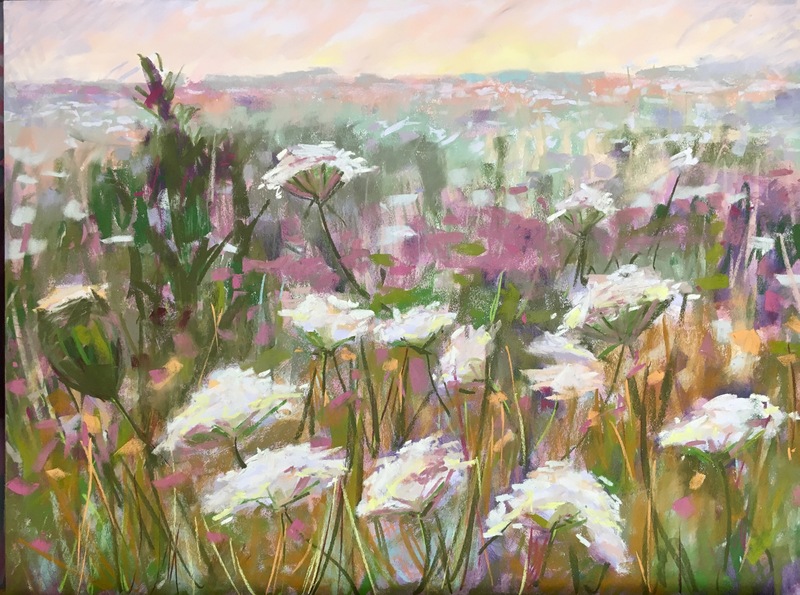 Even at the risk of itching or being poisoned, I am going to continue to stand in fields and paint my favorite wildflower. 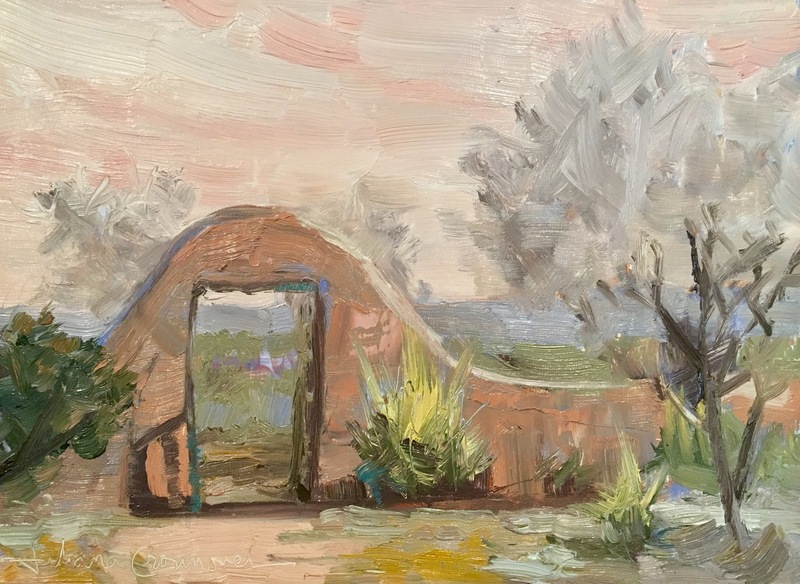 My mom recently signed up for my oil painting class at Ghost Ranch this summer. 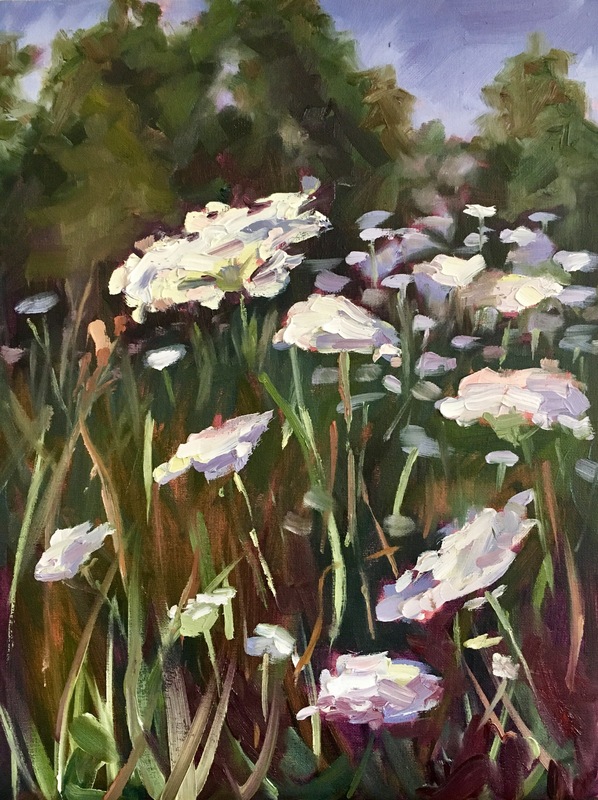 During her Mother’s Day visit I asked if she would like to watch how a oil painting comes together and she replied “yes, paint more Queen Anne’s’ Lace.” Here is the painting. If you look at the shot below you can see the bright pink underpainting I started with. Beautiful Texas field. Late spring is so beautiful here. Not pictured: a family picnicing and playing soccer in the field between me and the tree. I belong to a soccer family, and a picnic family – their family made me so happy. While I don’t really look like I might understand much spanish, I understand more than you might guess, and food and soccer are probably my spanish language strong points. I listened, and they talked about me and my painting! 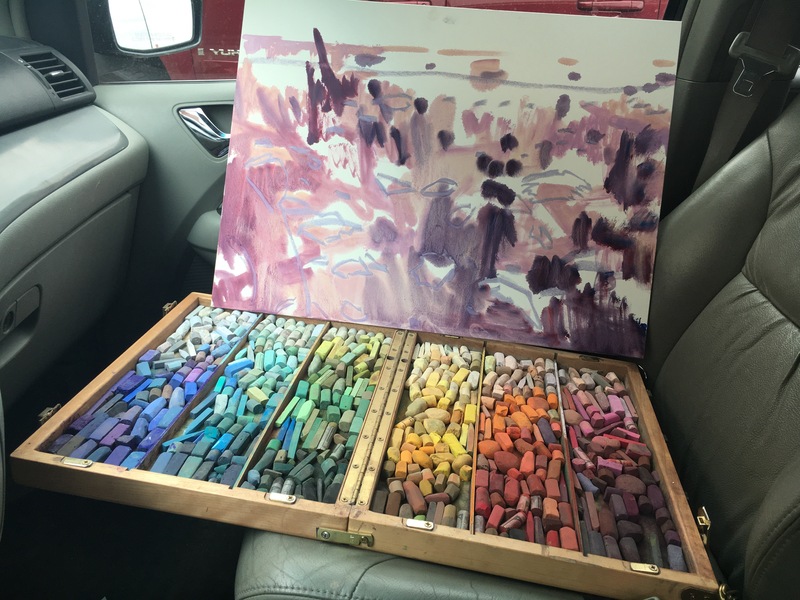 The family loved it, and discussed how much it looked like what I was painting. 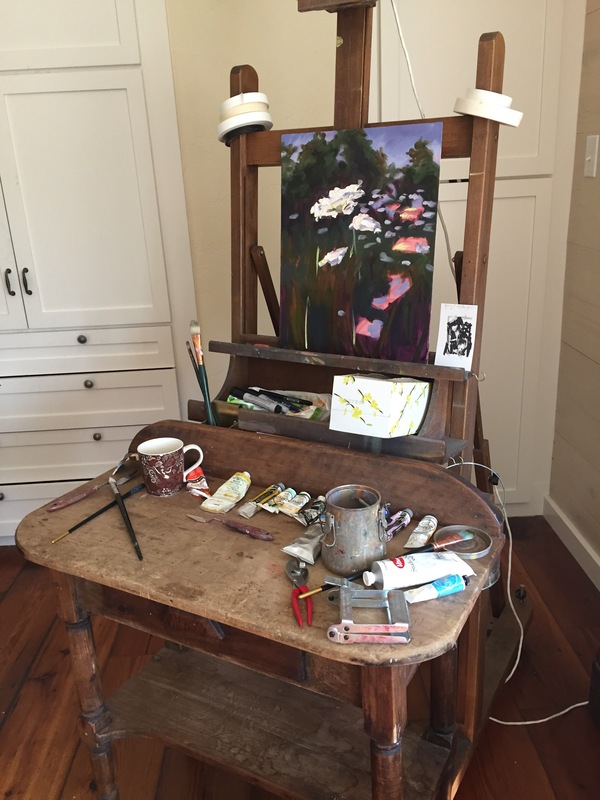 They talked about artists they knew, and wondered if those people ever painted from life. Then they sent a son to talk to me, and I did not confess I had been listening to them the whole time (perhaps they could tell by my head swollen from their kind words). 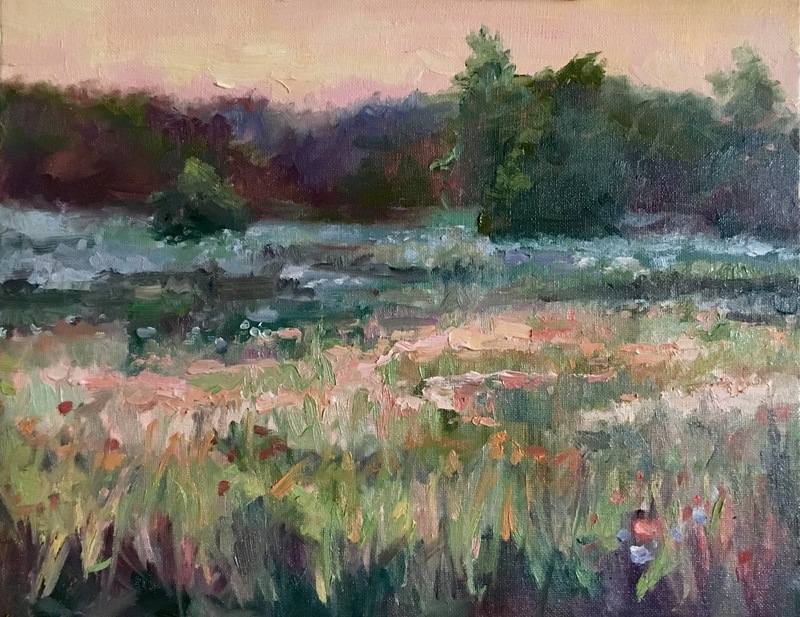 The same way the boys kicking a soccer ball and family picnicing had delighted me, my painting Plein Air had returned the favor. I love the soft, quiet feel of this desert scene. The sky was actually blue, but it felt atmospheric, so I felt the soft peach captures the mood better. I have enjoyed exploring this beautiful light on my pond.